A few weeks ago, I created my perfect smartphone by combining the best specs and features from current flagships into one device. I shared it with you in a post and asked you to tell me what your perfect smartphone would look like via a short survey. Around 2,000 Android Authority readers participated, revealing things like the display, performance standard, and camera they would like to see on the phone of their dreams. Here are the results. The majority of participants want their perfect smartphone to feature the display found on the Galaxy S9 Plus. As a refresher, it’s a 6.2-inch Super AMOLED panel with QHD+ resolution, an 18.5:9 aspect ratio, and curved edges. The V30’s display — which was my choice — comes in second with 20.2 percent. It also uses OLED technology and offers QHD+ resolution, but is a little smaller at 6 inches, has a slightly different aspect ratio of 18:9, and doesn’t have curved edges. Surprisingly, the Pixel 2’s screen was the third choice with 6.5 percent. It measures only 5 inches, which makes it far from ideal for playing games and consuming content. However, it gives the smartphone a compact size, making it easy to use with one hand and slip into a pocket. The display of the LG G7 ThinQ came in fourth with 5.7 percent. The reason for the bad result might be because it’s an LCD panel and has a notch, which a lot of people don’t like. Around 5 percent of participants didn’t like the four choices listed and would rather go with a display found on a different device. When it comes to performance, the winner is clear. Like me, most of the survey participants want their perfect smartphone to come with the same Snapdragon 845 chipset and 8GB of RAM the OnePlus 6 packs. The Galaxy S9 Plus comes in second, sporting the Snapdragon 845 or Exynos 9810 chipset depending on the region and 6GB of RAM. The Huawei P20 Pro took the third spot, but it only received 3.9 percent of votes. It also has 6GB of RAM like the Galaxy S9 Plus but is powered by the company’s own Kirin 970 chipset, which isn’t as well known as Qualcomm’s offering. Exactly 1.4 percent of participants didn’t like the three options given and decided to go with a different smartphone. The Pixel 2 XL was the most common one from the answers received, which is powered by the older Snapdragon 835 chipset and 4GB of RAM. That’s not the latest and greatest but is still more than good enough even for most power users. The winner in this category is the Huawei P20 Pro, which features a triple-camera setup on the back. This was my choice as well, mainly because the cameras can capture really great images in low-light conditions. The Pixel 2 was the second choice with 29.9 percent of votes, despite the fact it features a single camera. However, more cameras don’t always translate to better picture quality. The Pixel 2’s camera is still one of the best ones out there and can even capture single-lens bokeh images thanks to software trickery. The Galaxy S9 Plus’ camera only received around 20 percent of votes. The Galaxy S9 Plus’ dual-camera setup comes in third with 19.9 percent of votes. It offers dual aperture that Samsung claims should improve low-light photography, but our very own Gary Sims called it a gimmick after testing it out. The dual cameras of the LG G7 ThinQ took the number four spot with just over five percent of votes, which doesn’t make it very popular. I guess the standard/wide angle combo isn’t as interesting to users as LG probably thinks. Roughly around 1 percent of participants didn’t like any of the four choices given and entered in custom responses, with the HTC U12 Plus’ camera coming in as the most popular one. Almost half of our survey participants don’t want a skin on their perfect smartphone; they would rather go with stock Android. This makes you wonder why companies invest so much money into Android skins if most people don’t like them. Then again, as enthusiasts, Android Authority’s readers, like Android Authority’s writers, are not necessarily representative of the mass market to whom they are appealing. OxygenOS comes in second with 28 percent of votes. This is my choice as well, as it offers a stock-like experience but adds a few useful features on top. It’s followed by Samsung’s Experience with roughly 18 percent and HTC’s Sense with 2.7 percent. Exactly 2.6 percent of participants prefer a skin from a different manufacturer, with the two most popular being Huawei’s EMUI and Xiaomi’s MIUI. When it comes to design, the majority of our survey participants (51.4 percent) want their perfect smartphone to look like the Galaxy S9 Plus. It features thin bezels, a metal frame, and a minimalistic glass back. My choice was the Huawei Mate 10 Pro, which comes in second with 18.6 percent of votes. It also sports thin bezels, a metal frame and a glass rear, but comes with a gorgeous reflective stripe at the back that runs horizontally across the cameras and gives the smartphone more character. The Google Pixel 2 XL took the third spot with its metal and glass body, followed by the LG G7 ThinQ that sports a metal frame, a glass back, and a notch up front. Around six percent of people don’t like how any of these devices look and typed in their own answers, with the OnePlus 6 getting the most mentions. The last survey question called “What other features would you add to your perfect smartphone?” was the only one that allowed more than one answer — which is why the results are so close together. IP68 rating for protection against water and dust is the most popular feature (20.2 percent), followed by the headphone jack with 18.8 percent. Dual front-facing speakers, which are hard to find on many smartphones these days, came in at number three (18 percent). Expandable storage got 16 percent of votes, while an in-display fingerprint scanner took the fifth spot with just 13.9 percent. The low interest might be caused by the fact that in-display fingerprint scanners still don’t work quite as fast as those typically found on the back of high-end smartphones. Wireless charging comes in last with 12 percent, which means a lot of users don’t really want it anymore, echoing the thoughts of OEMs who are increasingly removing it. We also received a number of custom answers regarding the features participants would like to see on their perfect smartphones, with a removable battery and Quad DAC getting the most mentions. Based on the winner in each category, the survey participants’ perfect smartphone has the display and looks of the Galaxy S9 Plus, the performance of the high-end version of the OnePlus 6, and the Huawei P20 Pro’s triple-camera setup. 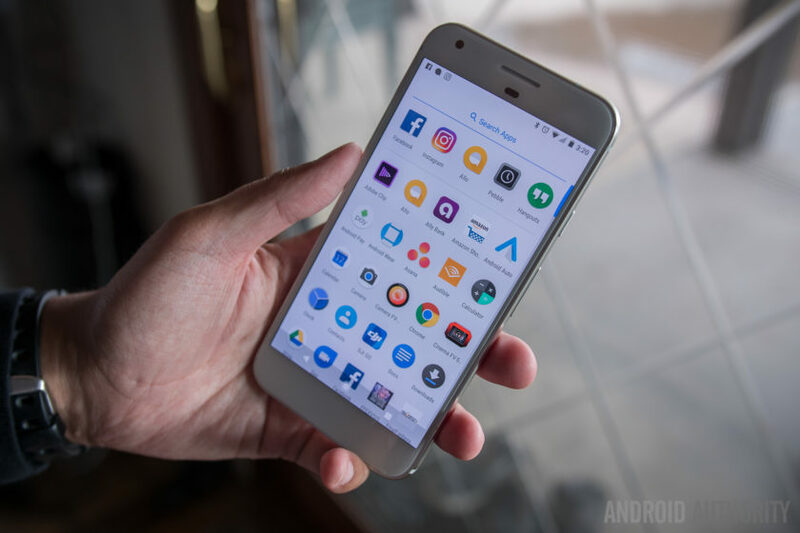 It also runs a stock version of Android and comes with additional features including an IP68 rating, a headphone jack, and dual-front facing speakers. It’s a beast of a phone that would get a lot of attention if it actually did exist. Would you buy this device over the current flagships on the market? Let us know by posting a comment down below.